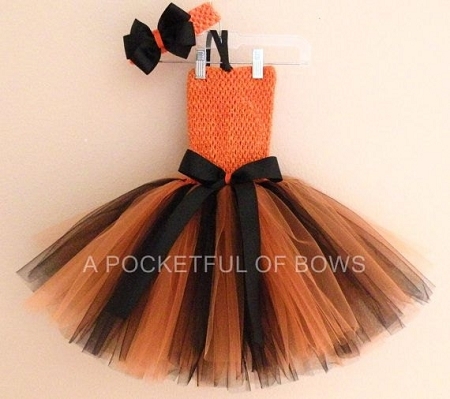 This tutu dress has an orange top with black halter straps. The fluffy skirt is orange and black with a black bow at the waist. The bow is on a clip and can be clipped to the front or back of the skirt. It comes with a matching headband with an attached bow. or a bow clip. Perfect for a party, Halloween or just for play. MAKE MY SKIRT EXTRA FLUFFY: This feature adds more fabric to the skirt for a fuller look.